All buses in the Stockholm county are red, except the ones that are blue so people talk about the blue buses as “blue buses”, instead of using their official line numbers. In Sollentuna, an suburb a mere 35-minute bike ride from downtown Stockholm, only the 179 that goes southwest from the commuter train station to Vällingby is blue, the rest of them are red. About 35 years ago, a ten-year-old, fair-haired boy got off a red bus number 520 at the Sollentunavallen stop. He crossed the street, and had he taken a moment to take in the view instead of running down the stairs, he would’ve seen a 17th century mansion at the end of a Baltic sea bay, but his eyes were set on one thing only: the outdoor hockey rink. The outdoor rink is gone now as is the other outdoor rink that was built next to the first one. Both are now indoor rinks, the first outdoor rink being now the “arena”, the second one a very cold practice rink. On the red-brick walls of the arena there are two large ceramic images of local sports stars. In one of them, the one closest to the stairs that take you to the bus stop, there’s Kajsa Bergqvist, clearing 2.02 in women’s high jump at the 2005 World Championships in Helsinki, Finland. 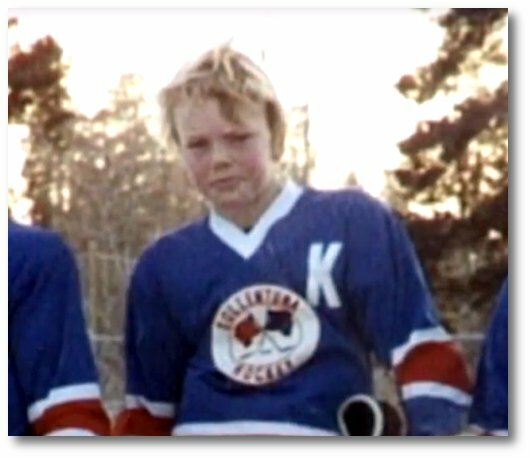 The other image, next to the entrance to the hockey rink, is a large photo of Mats Sundin in a Toronto Maple Leafs jersey, carrying the puck down the ice. And from there, Mats has the best view over the bay, that view he may have missed when he took the bus from Viby to Sollentunavallen, the sports center.